What does it mean to struggle? The dictionary defines it as “forceful or violent efforts to get free of restraint or constriction”. Everyone goes through periods of struggle in all areas of life. Obviously when life is hard and you’re in a challenging season, you will be struggling to get through. But what if you’re not going through a challenging season? What if you’re struggling day in and day out and you don’t really know why? If you’re feeling this way, chances are you are struggling mentally. Your brain perceives threats, restraints, and constrictions and you are forcefully trying to break away from them. Finding that it’s not working, you may feel exhausted, hopeless, worthless, and like a failure. I want to assure you that you are not alone in this struggle. 1 in 4 Americans suffer from a diagnosable and treatable mental illness in any given year1. Below is a guide to understanding the basics of mental illness, what you may be experiencing, how to seek help, and what happens when help is sought. You are also encouraged to check out our additional resources to the right of this page as well as on our resources page. A mental illness is generally defined as “any illness of the brain”. It can be further described as “the psychological state of someone who has emotional or behavioral problems serious enough to require psychiatric intervention”. What is the difference between a Mental Illness, a Mental Disorder, and a Mood Disorder? A mental disorder is defined as “a psychological disorder of thought or emotion”. It is used as a more neutral term than ‘mental illness’. A mood disorder is defined as “a psychological disorder characterized by the elevation or lowering of a person’s mood”. The differences between the three are slight. A mental illness and a mental disorder can be used interchangeably. One might use ‘disorder’ instead of ‘illness’ if speaking in a broader scope of psychology. A mood disorder, on the other hand, is more specific to feelings and emotion. How do I know if my feelings are severe enough to be labeled as an illness or a disorder? A good rule of thumb is to decide how much your feelings are affecting your day-to-day life. Do your feelings interfere with your ability to accomplish daily tasks, such as waking up, getting dressed, bathing, preparing or eating food? Do your feelings interfere with your day to day responsibilities, such as work, school work, or family obligations? Do your feelings interfere with your personal relationships? Do you feel isolated, hated, a burden? Are you avoiding close friends or family, or are you lashing out or pushing others away? Have you noticed a definite change in behavior or thinking patterns, such as not enjoying activities you used to enjoy, feeling tired all of the time, or having negative thoughts that you can’t seem to shut out? If you’ve answered ‘yes’ to any of those questions, it is a good indicator that your feelings may have escalated to a mental illness. How does mental health relate to physical health? Mental health affects us in the same way physical health does. Just like anyone – regardless of age, race, social status, income, etc. – can get the flu, so too anyone can get a mental illness. How do you know you have the flu? You will experience symptoms of the flu. You will have a fever, feel achy, tired, and nauseous. When you recognize these symptoms, that is when you realize that ‘Ah! Something is wrong!’. Now what do you do when you recognize you have the flu? You treat it. There is no medicine to cure the flu, but you can take medicine to help relieve the symptoms. You treat your body with care and respect; you eat chicken soup, you keep your fluids up, and you rest. What would happen if you completely ignored your flu symptoms and decided to continue on your day as if nothing were wrong? Your flu would get worse, it would be harder to recover from, and you even run the risk of exhausting your body to the point of death. Similarly, if you realize that you have the symptoms of a mental illness, it should be a clue that something is wrong. You need to seek treatment, which in most cases is a combination of medication and talk therapy. You need to treat your body with care and respect by taking things easy, accepting help, and reshaping the way you think. Medication can help significantly with the symptoms. If you choose to ignore the symptoms and try to continue on your day as if nothing were wrong, your illness will get worse, it will be harder to recover from, and you run the risk of dying. What? I can die from a mental illness? Living with a mood disorder such as depression or anxiety greatly increases one’s risk of suicidal ideation (thinking about or planning a suicide attempt). In fact, 90% of people who die by suicide have a diagnosable and treatable mental illness at the time of death2. Suicidal ideation is a symptom of the illness, and with treatment those symptoms can be alleviated. I think I’m ready to get some help. What do I do first? Taking the first step to get help can be scary. You will feel doubts, you will question your decision to get help, and you will question whether you can really ever feel better. I want to encourage you that you have just as much worth, potential, and value as any other person. Today’s treatments for mental illnesses are highly effective; anywhere from 70% to 90%of people have significant reduction of symptoms and improved quality of life with a combination of medication and talk-therapy treatments. You too can experience this success. Get a full checkup to make sure there aren’t any physical causes for your symptoms (head trauma, low blood sugar, etc.) 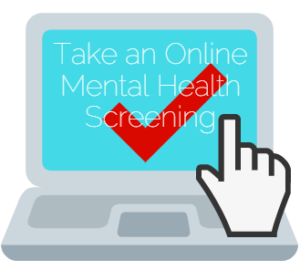 Make it a point to tell your doctor about your mental health symptoms and ask for a mental health checkup. Your doctor will most likely refer you to a therapist or psychologist and prescribe some anti-depressants or anxiety medication to take until you can get to your next appointment. Mental health services are in great demand but low supply. Unfortunately this means it could take several weeks until you can make your referral appointment. It is very important to have medication to help you between your doctor’s appointment and your referral appointment. The first meeting is called "intake" – this is when you fill out forms regarding your physical, psychological, and social past. This provides a base for you and your therapist to begin discussing what you’re feeling and what in your life could be contributing to it. Don’t get discouraged if you feel like no progress was made during your first visit; it usually takes a couple of sessions until you really get into the “meat” of recovering from your illness. It is also important to listen to the advice given to you. Remember that your therapist has been trained to help you recover and his/her job is to work with you, not to boss you around. If you feel like you and your therapist aren’t clicking, request to get a new therapist. Many of us are lucky enough to be surrounded by friends and family that care for us and want us to succeed. Let your friends/family know what is going on in your life, and ask that they walk with you through your recovery process. You will have down days. You will have days when you believe that you are relapsing and that you can never recover. It is so important to have a support system in place when these days happen. If you don’t feel like your friends or family can be a good support system, reach out to your therapist and ask about local support groups, churches, online forums, or community groups that you may be able to join. You can find support just about anywhere. Check out our Get Help links to find local agencies, online forums, and hotline numbers to assist you. 2. Conwell Y, Brent D. Suicide and aging I: patterns of psychiatric diagnosis. International Psychogeriatrics, 1995; 7(2): 149-64. Are You Coping With Suicidal Thoughts? Talking about Suicide. Any talk of death, self-harm, or wishing they were never born. Seeking lethal means. Looking for access to guns, pills, knives, or other objects that could be used for a suicide attempt. No hope for the future. Expressing helplessness and hopelessness, feeling they are trapped and that things will never change. Self loathing and Self hatred. Feelings of guilt, shame, or being a burden on others. Getting affairs in order. Making a will, giving away possessions. Saying goodbye. Unexpected visits, saying goodbye as if they won’t see you again. Withdrawal from others. Increasing social isolation and a desire to be left alone. Self destructive behavior. Increased drug and alcohol use, reckless driving, taking unnecessary risks.